Karmenu Vella, EU Commissioner for Environment, Maritime Affairs and Fisheries is meeting with ocean research leaders at the European Marine Board offices in Ostend, Belgium, today to discuss ocean research challenges. The meeting with Commissioner Vella follows on from a previous consultation, held in March, which identified ocean observation and seabed mapping as crucially important for managing human activities in European seas and across the global ocean. Today’s meeting will advance the discussions on ocean observing and seabed mapping in Europe (set within a global context), by identifying critical gaps in our capability, investment needs and potential funding sources for the future. “The ocean research community in Europe has led the development of ocean observing technologies and programmes which deliver valuable data for a range of scientific, commercial and public users” explains Dr. Niall McDonough, Executive Secretary of the European Marine Board. “But there are big gaps in the system. Commissioner Vella is showing his commitment in advocating for adequate investment for ocean research and technology development and we welcome the opportunity to present the views of the marine research community to the Commissioner and his team.” The meeting with Commissioner Vella marks the second in a series and is an important platform for the ocean research community to communicate directly with the Commissioner on ocean research issues. The meeting agenda and press release are both available online. 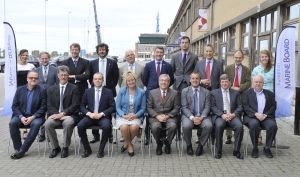 Picture features Commissioner Vella with CEOs and representatives of European Marine Board member institutes.